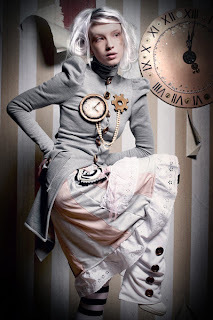 Those of you who know us well at badcandy.co.uk, know that we're big advocates of Steampunk style. 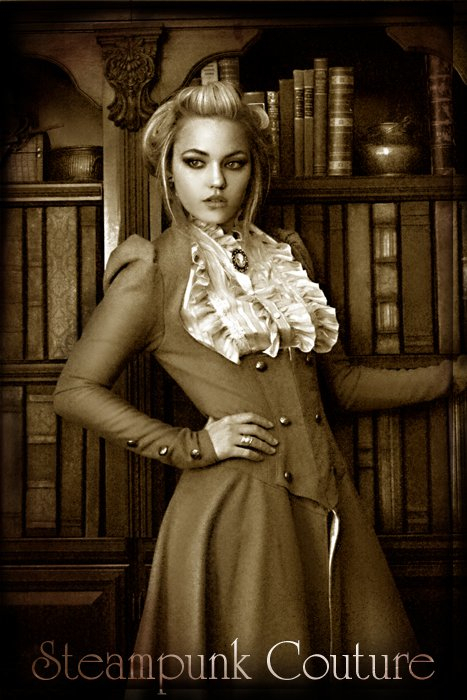 We're also big fans of Steampunk Couture Clothing and thought we'd have a little chat with the artistic brain behind the much loved designs, Kato, to find out a little more about her creative world. A little introduction in her own words, "I was born and raised in Wales, UK, and emigrated to America in 2007. 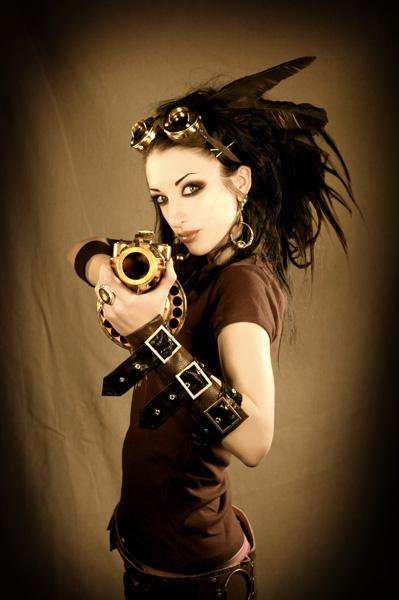 I decided to house my designs under the name 'SteampunkCoutureClothing' in 2005 after a friend introduced me to the term "steampunk" when describing the way I dressed, my style of illustration and most importantly, the couture clothing that I was making for a small number of clients from my kitchen table. Six years on, the business operates out of Hollywood and Portland..."
K: "Steampunk jewellery takes many forms, the most popular of which is an intricate, highly-decorative style that encompasses salvaged watch parts - gears, cogs and clock faces and combines these with pearls and brass chain. 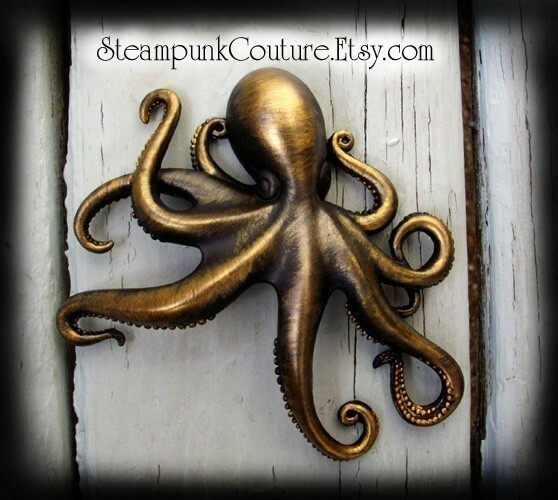 This style is extremely popular and easily found when one starts searching for steampunk jewellery. There are other, more original styles being created that lean toward Victorian collars, specimen vials or mini terrariums that have a strong steampunk aesthetic." "To have my pieces mass manufactured would be more cost-affective and possibly quicker, but my specific demographic gravitate toward my work because they know it's hand-made." "My personal favourites when it comes to Jewellery have always been, for as far back as I can remember, anything that you can read a mile away! I love, appreciate and wear jewelry that not necessarily makes a statement, but is bold and simple in shape and of course is clear in it's style so that you know exactly what you would wear it with before you've had a moment to think about it. I tend to shy away from intricate, fiddly jewelry and basically anything that doesn't read well in photo shoots." "I left school at 16 and took a foundation course in art and design at a local college, specialising in fine art in my second year. I then took a 9 month fashion and textiles course at an art school in south Wales; but leaving high school was a bigger escape and release for my creativity than I'd expected, and the freedom that came from not having to wear a school uniform any more catapulted my personal exploration of fashion and design forward. After realizing that my teachers were not there to guide me or offer advice and that I had to find my own path, I spent most of my art school days at home, messing around with various crafts and art mediums. I left with a Diploma from art school as a bribe from the head of the school after I threatened to drop out. The Diploma has never come in handy. My father is a very successful fine art painter and I inherited that creative gene while also being greatly inspired and encouraged by him. I'm self-taught in everything that I do and I'm always learning." "Early on I would make specific accessories for the outfit we were shooting, but now I really plan ahead and collect pieces that suit my design styles. During a shoot, I'll get all the jewellery out and choose the items that work. Styling is one of the easiest and most enjoyable parts of the job." "I'm all about hiring other artists to work with me now as I'm struggling to meet the customer demand on my own, so I'm currently scouting for talented artists in the jewellery design word to create exclusives for Steampunk Couture. Look out for an exciting jewellery line in the near future as a result of a wonderful collaboration. This year is all about putting the "team" in steampunk!" And with that she's gone in the flash of a big bronze ray gun! Bad Candy Jewellery - S/S11 Updates - Sneak Peek! Part I: Bad Candy Jewellery in action! Beautiful statement fashion jewellery at great prices, with FREE UK gift-boxed shipping! badcandy.co.uk. Awesome Inc. theme. Powered by Blogger.